Certainly the most obvious and compelling reason to change tires is because you’ve reached minimum tread. Regardless of your driving circumstances, hitting that minimum tread mark means it’s time to change tires. In the U.S., the minimum tread depth is 2/32". Anything less than that compromises your performance and safety. Your ability to stop will take nearly twice as long. If you’re driving on a wet road, your stopping power can make the difference between arriving at your destination safe and sound – and not. To easily determine your tire tread status, see How to use a tire tread gauge. 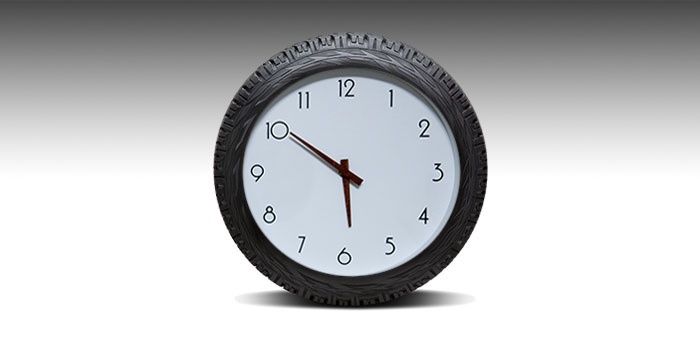 In some unique cases, tires will actually expire due to age before reaching minimum tread depth. The tire compound and resins that are so critical to proper tire performance do eventually reach a degraded state and become less effective. When you’re not driving for an extended period of time, you can extend the life of your tires by keeping them out of direct sunlight and in a garage or other indoor storage location. Inside, keep them away from windows. Some tire cleaners can actually accelerate the degradation process and shorten your tire’s lifespan. Avoid using petroleum-based products that can promote cracking. Letting your tires sit in one position for too long can also increase the risk of damage. While tire lifespan is generally determined by the conditions of use and/or storage, 6-10 years of tire life is a general rule. If you believe you’re experiencing diminished tire performance and traction, but the tread depth is still sufficient, tire age could be the cause. Changing tires is a matter of seasonal routine (twice a year) for most northern and mountain region drivers. Had enough of lackluster wintertime performance and stressful winter drives? Tires are the likely source of your wintertime driving woes. A set of winter tires, or all-weather tires could be the solution. Winter tires give you more confidence driving in winter conditions and improve your safety. You’ll see better stopping capability, even on ice and loose snow, as well as a better grip on slick, icy, slushy roads. Look for the three-peak mountain snowflake (3PMSF) when tire shopping. This symbol means the tire has the ability to perform even in severe snow. By changing to seasonally appropriate tires throughout the year, vehicle performance and safety are maximized. Increasing or altering vehicle performance is a common and very legitimate reason to change tires. In fact, if more people understood just how integral tires are to overall vehicle performance, we’d likely see many more drivers changing tires simply to improve performance. Disappointed in how your 4X4 performs off-road? An aggressive set of all-terrain tires would most likely remedy that shortcoming. And to maximize the capability, handling, and feel of any performance or sports car, top tier performance tires are a must. Your SUV or truck drivetrain might be capable of towing or hauling a significant maximum weight, but the tires also have to be up to the task. Tires also have a significant influence on comfort, and the cabin environment. One set of tires can create a completely different cabin environment from another. The amount of road noise, and ride comfort/compliance can be substantially altered with tires. Changing the day-to-day driving attributes of your vehicle to fit your preferences is yet another valid reason to change tires. In cases other than tire expiration, the question of how often to change tires is a very individual one. Tires are fundamental to optimizing the compatibility of your vehicle with your life and driving circumstances. Want help finding the perfect set of tires? Shop at TireBuyer, enter your vehicle information and we’ll show you some great tire matches – or give us a call at (866) 961-8668 for personalized recommendations.